Happy New Year!! Hope everyone enjoyed their holiday and got a chance to spend time with family and friends! So are you ready for the new year? How about a new challenge? Today on All That Scraps Challenge is the start of a new COLOR challenge... PINK, RED, and CHOCOLATE. Heart Kiki La Rue is from the ATS December release. Followed the sketch from The Sweet Stop, and with this adorable sweetheart, it could be used for any occasion... reason why I left out a sentiment. Paper is from BG Kissing Booth, a heart with key punch from MS, and a border punch from EK Success. Finished it a ribbon from Michael's, and all sides distressed with Colorbox brown ink. Check out the ATS Challenge blog to see more from the team. Hope you can join us on this fun challenge, and the prize this time is 3 CC Design Rubber Stamps!! You have two weeks to link up and play along! May it be filled with love and laughter! This is so sweet! Just precious!! how super cute!! happy new year! 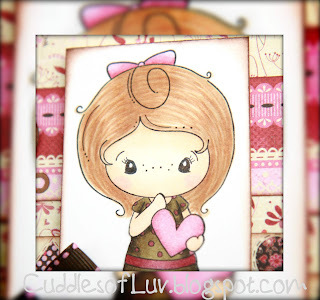 Such an adorable card, your design and papers are so pretty and your image is so sweet!! Thanks so much for joining the Simon Says Stamp challenge. Adorable, love this paper and your coloring is yummy. Thanks for playing at The Sweet Stop. Super sweet! Love the soft colors and layout! happy new year!